“You have great skin.” “Look at your skin! Mine doesn’t look like that.” “Your skin glows.” DUDE…all three of those sentences have been said to me this last week. ME! The girl who used to lay with ice packs on her neck for 30 minutes every night because the cystic acne was so bad. ME! The girl who once had a friend come up and say, “your face is so ruddy.” Ruddy? I had to look it up. Then I cried. So when I heard those three sentences this last week, I wanted to melt in my happiness. Is my skin perfect? No…I’ve got sun damage and wrinkles, but my skin IS clear and smooth, and I do think I glow. Here’s what’s changed. You all know that I quit sugar and gluten a few years ago. SO much of my skin issues cleared up at that time. Like…immediately! First things first..if you are eating like crap, your skin is going to show it. Clean up your diet. Quit the wine. Add tons of healthy fat and drink more water. I started to do an overhaul on the types of products that I was using on my face. I’m in the sun a lot, I’m sweating for 1-3 hours a day, I take a lot of showers, I’m getting older (dryer, thinner skin) and I had been using so many products geared towards acne and that needed to change. I started adding face oils to my regimen and immediately saw results, but when I had been gifted Lumion Oxygen Mist and then, later, Lumion Oxygen Serum, I saw a BIG difference in the overall clarity of my skin. Yes, yes and YES! This stuff works. I also like it because once I apply it, I don’t feel it. It’s more like a fast absorbing gel. It leaves zero shine or slickness. PLUS…they do not test on animals, and there are no parabens, dyes, fragrances, sulfates, phthalates, or alcohol. Just magic. It just contains magic. Lumion was cool to give me a special offer for YOU. Go HERE to order, and if you use the promo code CASSIE15 at checkout, you’ll get 15% off. Try it! I know you’ll love it!!!! The other big switch I made was investing in a nice selection of RMS Beauty. Most everything created by RMS has a coconut oil base. This means that I glow, but I’m never shiny. There is zero junk in these products. You use your fingers to apply them, and they always look amazing. I feel like they make me look younger. Powdery makeup seems to settle into my fine lines. This doesn’t. Am I dewy? I think so!!! You need to read about this company HERE. Maybe my skin looks better because I’m making a conscious effort to be less stressed? This little book about journaling helps me a lot. I don’t want to write about the same thing every day. 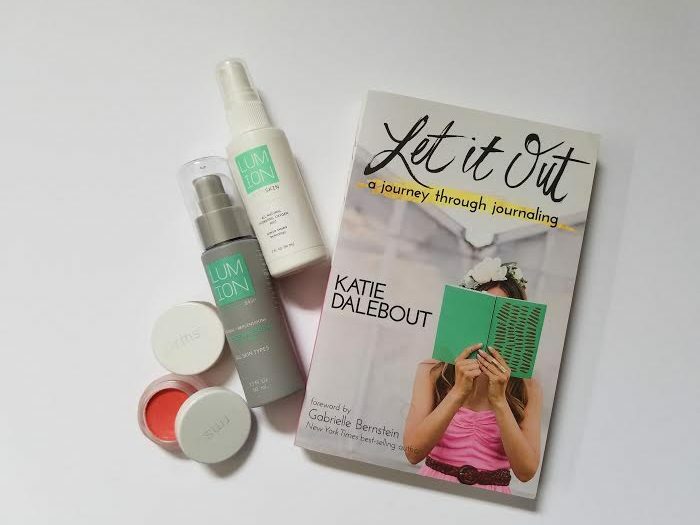 “Let It Out” has a whole bunch of ideas and prompts to keep my journaling fresh. Phew! That was a LOT. I hope you check these things out and let me know what you think. Ooooh! One more thing…both cosmetic companies are owned by women entrepreneurs. You know how I love that!